We introduced the ability to quickly and easily scroll through Google Docs files on your Android phone or tablet. We’re excited to announce that we’re now launching that same functionality for your iOS device. 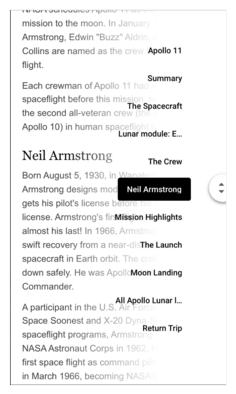 Starting today, when you begin scrolling in Google Docs on your iPhone or iPad, a small navigation handle will automatically appear on the side of the screen. Touching that handle will display any headers you’ve created or—if you haven’t manually applied them—headers that we’ve intelligently detected. This will allow you to quickly skip from section to section, instead of slowly swiping up and down.